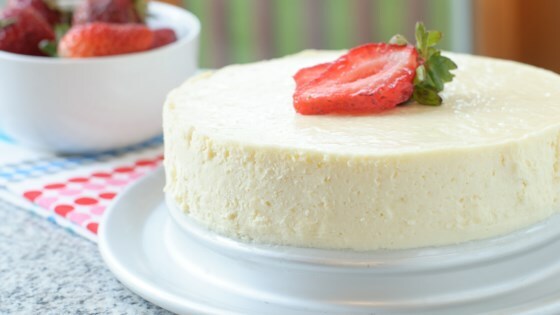 "A crustless Instant Pot® cheesecake. Garnish with strawberry syrup or whipped cream, if desired." Grease the inside of a springform pan. Place a rack in the bottom of a multi-functional pressure cooker (such as Instant Pot(R)) and add 1 inch of water. Blend cream cheese in a bowl using an electric mixer until completely smooth with no lumps. Add sugar substitute and vanilla extract. Blend until just incorporated. Add eggs 1 at a time and blend until completely mixed in, but do not overbeat. Pour batter in the prepared springform pan. Cover bottom and sides of pan tightly with a single piece of aluminum foil to prevent water from leaking into the pan. Lower the filled springform pan onto the rack in the pressure cooker pot. Close and lock the lid. Select high pressure according to manufacturer's instructions; set timer for 20 minutes. Allow 10 to 15 minutes for pressure to build. Release pressure using the natural-release method according to manufacturer's instructions, 10 to 40 minutes. Remove the lid and allow cheesecake to slightly cool inside the pressure cooker, 15 to 20 minutes. Remove the cheesecake carefully and allow to cool completely, about 30 minutes more. Remove aluminum foil; cover cheesecake with plastic wrap and refrigerate until chilled, 2 hours to overnight. Dice strawberries and sprinkle over cheesecake just before serving. An irresistible, smooth, and creamy cheesecake! You can use any cup for cup sugar substitute in this recipe. I followed the recipe. Turned out great. Will make again.